1. Connect the Red and Black track wires from the 7 connector Track and Function leads to the locomotive track power connections. 2. Connect the function leads that are to be used from the 7 conductor Track and Function wire set. 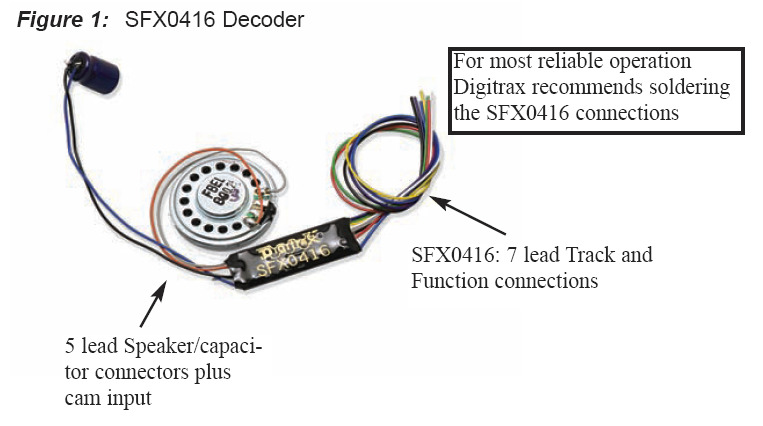 Note that to be able to readback Sound FX CV's a combination of function lead loads of at least 60mA at 12volts should be connected to these function leads. Insulate the unused function leads so they cannot short to the locomotive frame or track power. 3. Mount the 28mm speaker attached to the 5 conductor sound feature wire set in an appropriate sound enclosure. Be sure to inspect the speaker diaphragm for magnetic debris or damage, which will affect sound quality. Other speakers may be substituted in combination as long as the total impedance on the Orange/Gray wires of the 5 conductor sound wire set is 8 ohms or greater. 4. Mount the 330uF/25V electrolytic energy storage capacitor from the 5 conductor sound wire set. Be sure not to short the capacitor case or leads to the track leads or locomotive frame or damage to the decoder may result. 5. For Steam units with a synchronization cam capability, connect the White CAM lead of the 5 conductor sound wire set to the cam output connection. 6. 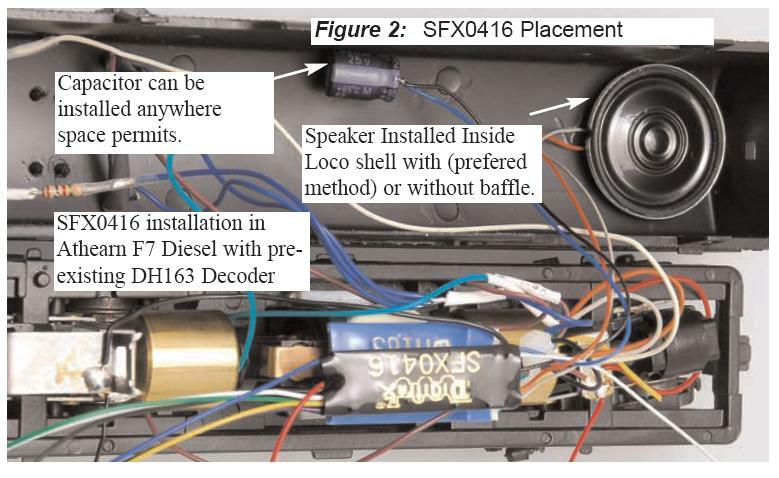 Inspect the installation before testing the sounds and replacing the shell. 7. Connect DCC track power from a compatible DCC system and select the factory default address 03 to enable sounds for testing. 8. Be sure F8 is OFF, and then press F1(bell) or F2 (whistle/horn) ON to hear these associated sounds. 9. Customize sounds by programming Sound CV's to adjust the desired configurations, as shown in the following tables of Sound FX CVs. Sound schemes other than the default Steam (CV60=0) or Diesel (CV60=1) schemes may be loaded by using a Digitrax PR3 as a Sound FX Programmer.